From the traditional greeting of ‘The Lord be with you’ and the communal echoes of ‘And also with you’, to the sending out ‘with’ God’s blessing, a theology of God’s ongoing presence in Jesus Christ is central and not without implication. Anglican Schools seeking to live out their sacred identity are a faithful expression of what it means to be with God, one another, ourselves and the world. In modern Australia, with dwindling affirmations of faith this is our peculiar and prophetic public witness. 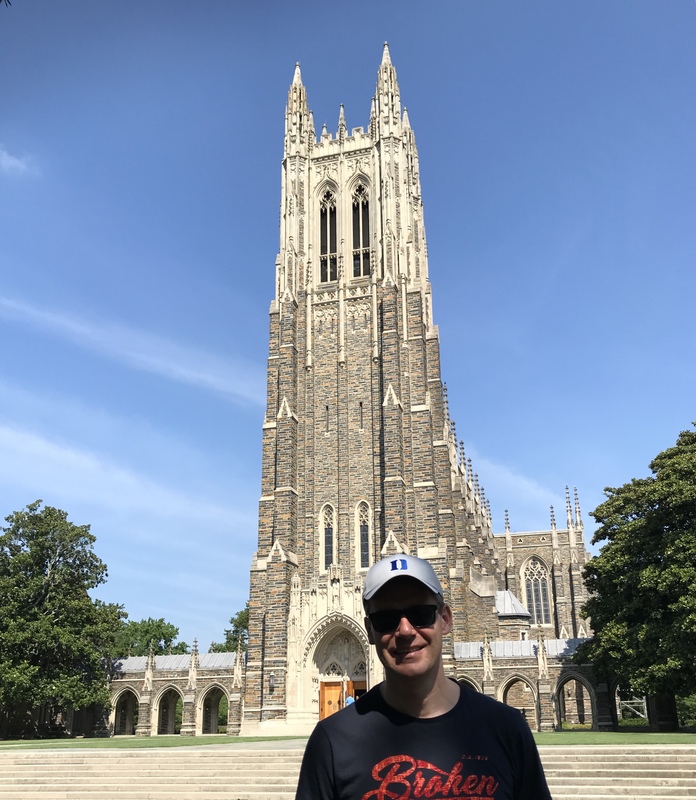 This year, I received the Bishop Barbara Darling Professional Development Grant for chaplaincy (Melbourne Diocese) and decided to visit Duke University, in Durham, North Carolina. My initial focus for the visit was to see how they were seeking to ‘Bridge Faith and Learning’ and converse about the many initiatives integrating faith and learning in their context. From the ministry of Duke Chapel to Duke Divinity School there was clear evidence of wholehearted collaboration across the disciplines of theology, the arts, politics, ecology and medicine. My imagination was captivated but also expanded as conversation partners at Duke Chapel and Duke Divinity School listened to my questions, heard the word ‘engagement’ repeatedly and asked whether I knew the work of another Anglican, the once Dean of Duke Chapel, the Reverend Dr. Samuel Wells. His published works include such books as the Nazareth Manifesto, Incarnational Mission and Incarnational Ministry. Sam Wells is now vicar of St. Martin in the Fields, Trafalgar Square, London and his wife the Reverend Dr. Jo Bailey Wells is Bishop of Dorking. Across his works Sam Wells identifies four modes of social engagement – working for, working with, being for and being with. Working for is taking direct action on behalf of others – bringing expertise (knowledge, skills, experience) to address a limited task in short time frame. Working with is empowering others through partnering alongside – asking questions, sharing targets, overcoming obstacles to resolve problems. Being for is advocating on behalf of others – through learning about, giving to and generally commenting on. Being with is encountering, accompanying and enjoying others not as a problem to be solved but in the spirit of genuine relationship. Perusing the Anglican Schools landscape, it is my view that all models of engagement are present and needed. Working for seems is often predominate, being for is preferred, working with is proclaimed and being with is largely presumed. There could be good reasons for this both historically and culturally, and you may disagree with my generalisation of the degrees of focus but at the very least it is worth asking how do we engage? Sam Wells contends that ‘being with’ is the most important of all modes of engagement, the foundation, the means and the end of social engagement. Being with is neglected not because of its perceived passivity and failure to make a difference but the challenge of possibly going too far into frontiers of the unknown. 13 When the Spirit of truth comes, he will guide you into all the truth; for he will not speak on his own, but will speak whatever he hears, and he will declare to you the things that are to come. 14 He will glorify me, because he will take what is mine and declare it to you. 15 All that the Father has is mine. For this reason I said that he will take what is mine and declare it to you. In the grand biblical narrative of creation, fall, redemption and consummation we see the centrality of God seeking to be with us not just for us. In Jesus’ teaching, life and works we see his presence and power in being with others, his call to freely come and be with him and his willingness to give and receive hospitality especially with those who are on the margins. Whilst much attention is rightly given to the final 3 years of his life in Galilee and the events of his final week in Jerusalem, Wells provocatively asks, ‘What was Jesus doing for the first 30 years of his life in Nazareth?’ Whilst this is not clearly revealed in scripture it would be safe to say he was fully participating in the highs and lows of human life, encountering, accompanying and embodying that God is with us. The grace of being with others is that it is inclusive of all people not just those with particular expertise. It is an invitation to all people who do not simply want to make a difference but desire to come alongside others not as problems to be solved but as people. Wells identifies eight dimensions of being which he derives from God’s Trinitarian nature and asks how they may be reflected in our being with the world: presence, attention, mystery, delight, participation, partnership, enjoyment and glory. Whilst working for, working with and being for are important, their true worth is seen when grounded and directed to a relationship of genuine freedom and consent. It is good and sometimes appropriate to rally money for a shared cause, organise an event of advocacy and bring in the inspiring guest speaker but we also need a ‘being with’ imagination to consider how we can be genuinely present to the other as guest and host, realise our own need and not perpetuate the have and have nots. The pedagogy of service-learning in many schools today is a good embodiment of being with, when it moves beyond and comes before a tone of problem solving and emphasizes mutual partnership. Anglican Schools and the ‘transforming service’ movement have already begun to move in this direction. Whilst service-learning is generally considered uncontroversial, it can be rightfully asked ‘who is the true benefactor?’ and do we serve to learn or because we are genuinely enjoying the company of those with us. Similarly, Inter-faith dialogue when grounded in relationship, holding differences and commonality in thoughtful dialogue, embodies true encounter, the other doesn’t become a means to my learning but may in fact become my friend. How does ‘being with’ connect with our Anglican identity as schools and how can we imagine new ways? Next Post What is the point of having a chaplain in an Anglican School?